After the wealthy stockbroker John H. Harbeck died at the Plaza Hotel after a short illness in 1910, his wife, Kate, set about to build the most expensive and impressive mausoleum at Woodlawn Cemetery. The architect Thomas E. Blake designed a 90-foot-tall marble octagon with a steeple, heavy bronze doors, Tiffany windows and a pipe organ. 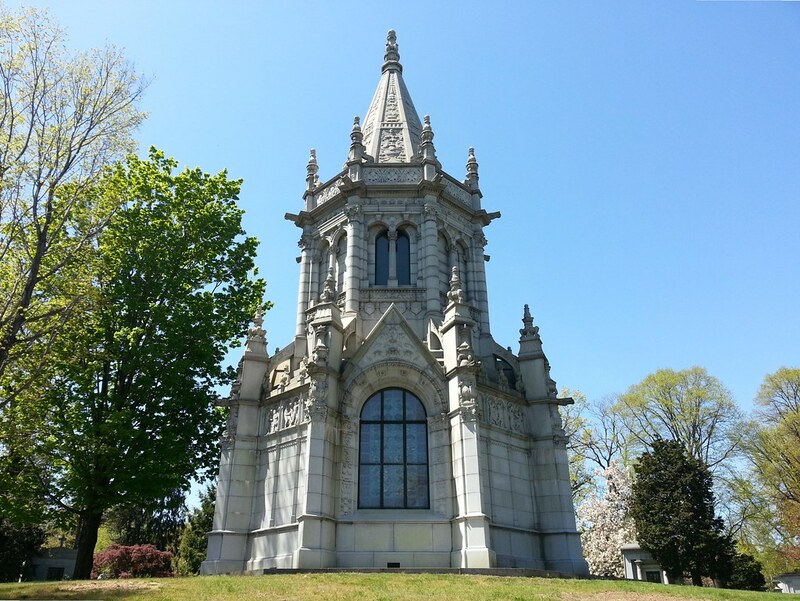 The mausoleum was built by Guastavino in 1918. Kate was buried in the mausoleum in 1930 after dying in freakish revolving door accident on New Year's Eve at the Plaza Hotel. • John and Kate were apparently doting pet owners who were ridiculed by their neighbors in Boulder, Colorado (where they had a summer home) for "holding expensive and elaborate funerals" for their dogs. • After meeting Kate, John went through some messy divorce proceedings with his wife, Caroline, that centered around determining whether Caroline was, in fact, his wife, legally speaking. The NY Times covered the trial pretty heavily, but also evinced some disdain for those captivated by the scandalous affair: "A great number of persons with nothing else to do crowded the court-room . . . yesterday morning, and many more stood in a line for hours waiting for an opportunity to enter". • In researching the Harbecks, I stumbled upon yet another example of how much better journalism was a hundred years ago. From a 1906 report in the NY Times: "LOST — A CEMENT BARREL. It Had a High Old Time Before It Invaded the Subway". The piece goes on to offer the reader some sage, hard-earned words of wisdom: "an old barrel that is out for a good time and does not care a hoop, any way, is a difficult thing to tackle in a stiff breeze." Some Italian lunatic residing in Turin has for months past been indulging in the monomania of writing and sending enormous quantities of letters to persons residing in this City . . . The recipients, regarding the matter as an oversight on the part of some foreign or traveling friend, pay the postage and open the letters only to find them filled with balderdash and senseless twaddle in Italian, with a faulty English translation appended, the nonsense being usually addressed "to the noble and illustrious reader," and the writer subscribing himself as "The Emperor of the World, Monarch of the Universe," &c.
I don’t have time to read the book but I can’t wait for the movie! I hope you have as much fun researching your stuff as we have reading it…. It is nice reading about how the wealthy had their selves entombed in years past. From some of the stories some had a nice life style. Keep on with the nice pictures and editorials. “an old barrel that is out for a good time and does not care a hoop, any way, is a difficult thing to tackle in a stiff breeze.” I just don’t know that it gets a whole lot better than this.